"Of course I interviewed at UVA and at William and Mary, but once I walked on campus at Hampden-Sydney, it was pretty straightforward. I knew it was the right place for me." 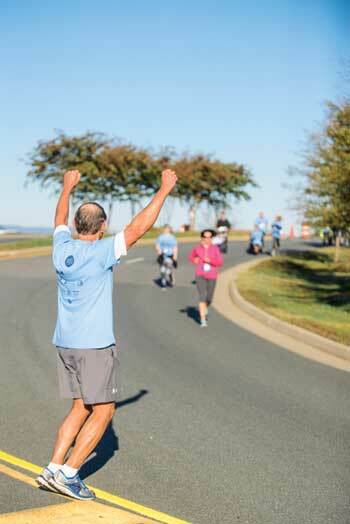 On a crisp fall morning in early November, over 1,000 Charlottesville-area residents gathered for a two-mile run on the grounds of Martha Jefferson Hospital to raise money for the Family Birthing Center and Special Care Nursery. Many of the participants weren't particularly athletic, and a good number of them pushed strollers along the race course. But all had come to honor a community legend: Dr. Edward T. Wolanski '78, who has delivered more than 10,000 children during his 30 years as an obstetrician. The event was organized by Wolanski's patients, past and present, to mark his retirement from the delivery room in December. Wolanski is passionate about forming meaningful relationships, investing in the community, and advocating a healthy lifestyle for both his patients and himself, so the Wolanski 2-Miler was a perfect way to come together as a community and commemorate his impact. To understand the scope of Wolanski's impact, one must first appreciate the sheer number of deliveries he attends to each year. In 2015, according to the American College of Obstetricians and Gynecologists, the average obstetrician delivered 150 babies; by comparison, Wolanski performed almost 400 deliveries in the same time span—averaging more than one a day. To provide further context, Wolanski alone delivered almost one-third of the approximately 1,200 children born at Charlottesville's Martha Jefferson Hospital last year, yet he is just one of 18 obstetricians practicing at the hospital. Over a 30-year career, most obstetricians would deliver between four and five thousand babies—only half of Wolanski's 10,000 deliveries. Wolanski's impact exceeds mere numbers, however. His commitment to providing one-on-one care throughout his patients' pregnancies also accounts for the outpouring of love. Wolanski finds it rewarding to provide patient care from start to finish, which is why he has been in solo practice since 1992. Beyond that, he performs all of his patients' deliveries, day or night, rather than relying on on-call physicians. That commitment has meant being on call 24 hours a day, seven days a week for the past 25 years, with the exception of the one-week vacation Wolanski allows himself each year. Asked how he manages the constant pace and lack of sleep, he says, "You've got to love what you're doing in order to be a solo practitioner. I wanted to practice medicine the way I like to see it done: one-on-one, actually taking care of somebody all the way through pregnancy and beyond." Cindy Wolanski—his wife of 34 years, as well as the office manager and an RN at his practice—has also been crucial to his success. "If I didn't have a wife who was so understanding and so supportive, I could never have done it." Wolanski says that despite the fulfillment he finds in obstetrics, "at age 60, I knew it was time to call it quits." Although he plans to continue his gynecology practice for several more years, in early 2016 he told his colleagues, "Just as Michael Jordan, Cal Ripken, Jr., and Derek Jeter decided to quit doing something they loved, I've decided to stop delivering babies." He notes that those athletes retired while still in their prime, and he wants to do the same. "I want to quit while I'm in a great place, not at the point of burnout. Nobody benefits from that—not the patients, not the doctor, and not the doctor's family." It wasn't until last spring that Wolanski even considered the total number of children he had delivered during his career. He says, "From year to year to year, you don't even think about such things. You just keep going. In fact, until a nurse asked me in May if I realized I was about to deliver my 5,000th baby this century, I had no idea." They did some research and realized he had surpassed 10,000 births in the Charlottesville area since 1986. The 10,000 figure has attracted quite a bit of attention. At the Wolanski 2-Miler in November was a camera crew for CBS Sunday Morning, whose feature story on Wolanski will air nationally in early January. Local television, radio, and print media have also reported in the past year on Wolanski's impressive career, but he claims that while he appreciates the accolades, the true reward is the relationships with his patients. He says, "The media attention is only temporary, but the fact that my patients remember me means I've made an impact." A recent anecdote proves just how much they do remember him. Over Thanksgiving weekend, Wolanski and one of his two adult sons attended a movie in Charlottesville. The woman working at the box office told his son, "Your dad delivered my kids!" Walking down the hall to the theater, they ran into three more people whose children he had delivered. Then, leaving the theater after the movie, two more patients approached them. Wolanski loves having that connection with so many people in his community and notes that the relatively small size of Charlottesville means he gets to keep up with his patients and to watch their children grow up. Right from the start, Wolanski knew he wanted to be a physician. In fact, it's what led him to Hampden-Sydney for his undergraduate degree. His high school chemistry teacher in Staunton, Jessie D. Ridgeway, Jr. '42, suggested Wolanski consider H-SC because of its strong track record for getting students into medical school. "Of course I interviewed at UVA and at William and Mary, but once I walked on campus at Hampden-Sydney, it was pretty straightforward. I knew it was the right place for me." Impressed by the strong chemistry and biology departments at the College, Wolanski also felt that the all-male atmosphere meant fewer distractions. And with his lofty ambitions, he needed to focus all of his time and energy on academics. Enrolling at H-SC in the fall of 1974, Wolanski set three goals for himself in addition to medical school: "I wanted to earn a 4.0 all four years, be class valedictorian, and make Phi Beta Kappa by my junior year." Like most goals that Wolanski sets for himself, he accomplished all three—sharing valedictorian distinction with two other classmates who also earned 4.0s, Orran L. Brown '78 and Barrye Wall '78. In order to do so, Wolanski admits to being "pretty much a nerd and a lab rat." He spent many all-nighters working in the chemistry department on the third floor of Gilmer—or the Palace, as the science majors liked to call it. One memorable night during his freshmen year left Wolanski convinced that his medical dreams were over. He and several other pre-med students were studying in the chemistry lab at two in the morning. "There was an ice machine up there, so of course we decided to have an ice fight," he recalls. "We filled up all of the lab containers with ice and water, and the fight stretched down the hall until there were puddles of water everywhere." Unbeknownst to them, the head of the pre-med program, Dr. Edward Crawford, was in the biology lab on the second floor, and water was leaking into his office. "He came up and simply asked us, 'Now boys, what are you doing up here at 2 a.m.?' We looked at each other and thought, 'We're done. We just blew our chance to go to med school.'" The boys cleaned up the mess, and apparently Crawford didn't hold it against them. "Darby Hand '77 became a physician, George Bumgardner '78 became a dentist, Fred Gall '77 became a plastic surgeon, and I became an OB, but we all thought our medical careers were over before they even began," he laughs. Nestled among the mementos that fill Wolanski's office—from trinkets given him by patients to a collection of antique medical tools-are several keepsakes from his Hampden-Sydney days. Dr. William W. Porterfield's recent book, Things That Might Have Happened at Hampden-Sydney, is propped up on the credenza, and Wolanski's Hampden-Sydney diploma and Phi Beta Kappa certificate hang prominently among the other awards and diplomas on the wall. He is particularly proud of a small glass plaque, only a few inches in diameter, presented to him between his junior and senior years at H-SC. The 40-year-old award is proof, according to Wolanski, of the excellence of a Hampden-Sydney education. One of just 25 undergraduate students chosen in 1977 to conduct cancer research at the Roswell Park Cancer Institute in Buffalo, New York, Wolanski was further honored to receive the prestigious Sidney Farber Research Award for his work that summer. He considers the award one of his greatest accomplishments-an accomplishment made possible by his academics at Hampden-Sydney. "The chemistry department prepared students so well to go anywhere and succeed. I was able to do the research that won the Farber Award because of the foundation I received at Hampden-Sydney." Asked how he'll fill his spare time when he's "only" practicing gynecology, Wolanski turns philosophical. "When I started my undergraduate degree, I had so many interests. As I got more and more focused, I had to cut those out, everything from fishing to baseball to running. But it's important to do other things, and I need to get those interests back in my life again." First and foremost, Wolanski plans to travel more with his family now that his schedule isn't determined by labor and delivery. He also hopes to volunteer with youth baseball, and to devote more time to current hobbies like riding his motorcycle, fishing, and running. He says that he might have one more marathon in him—he completed his 25th at the Richmond Marathon in November—and he's considering a pilot's license now that he has the time. One thing is certain: with his energy and enthusiasm, Wolanski will continue to impact the community in which he has built so many meaningful relationships.